Due to fortunate circumstances, I caught a picture of my dog being adorable. That dog has some of the oddest sleeping locations and preferences. All right, so he’s not as bad as my younger dog who sleeps on top of his crate. But still, he’s a bit odd. 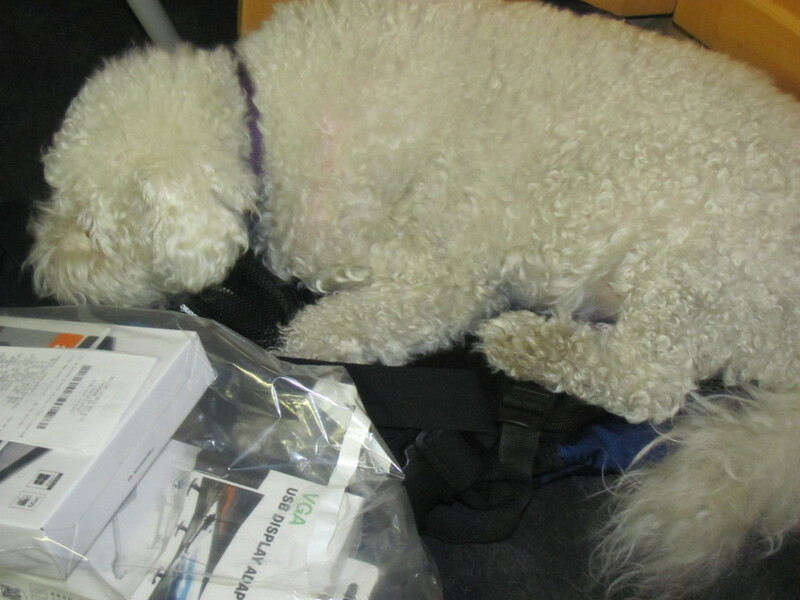 This evening, for example, I watched him slightly paw at an empty backpack on the ground before flopping down on it. My dog on the back of a backpack. Sleeping. You can’t quite see it very well, but the thing he’s on top if is the backpack. It was very cute, if slightly odd, and very much in keeping with this dog’s eccentricities. Anyways, happy Wednesday! We’re halfway there! This entry was posted in Uncategorized on July 31, 2013 by Webmaster. Anyways, today’s post is a discussion of fabric. More to the point, a discussion of food themed fabric. Until yesterday, (well, today as I’m writing this) I didn’t even know fabric with a food theme even existed. But due to exploring fabric.com, I came across an entire section of food printed fabric. This sparked a desire I never even knew I had. I now really want to make a waffle-print skirt. Or dress. Or maybe a skirt/handbag combo. Fresh Strawberry fabric actually looks like it might make a really cute summertime outfit. Especially for a younger child. As would basically anything watermelon. I was, alas, unable to find any prints with eggplants or steak on Fabric.com. I don’t know what I’d have done with a fabric with either of those foods on them, besides laugh, but even laughing would be worth it. Or have you seen any clothes made from some of these novelty fabrics? I’d love to hear about it! This entry was posted in crafts and projects, food, real world, Webmaster and tagged crafts and projects, fabric, food, real world, webmaster on July 30, 2013 by Webmaster. Hello, Fluffsters! Happy Monday! I hope your week is starting off phenomenally well. Today, I was struck by the concept of toy balls. They’re round, and they bounce. And sometimes they’re soft.They’re also frequently brightly colored, and sometimes a choking hazard. They also can provide hours of entertainment to children and adults. But who came up with them? First, people started playing around in the mud. It was nice and softly squishy. You could make designs with it, and mud pies, and all sorts of wonderful things. Then along came rocks. So one day, as little Johnny or Suzy was out playing in the wonderfully smooth and soft and delicate mud, a stone popped out of the ground, interrupting the previously uninterrupted hours of imaginative play. They must have been shocked. Especially if they’d never seen rocks before! Anyways. So after the rock stabbed him in the leg, Johnny would probably have examined it. If it stabbed him, it was probably a bit sharp. He might have thrown the rock away, or he might have kept it. Regardless, rocks were now introduced into the child’s play. After the rock was introduced, more rocks started to spring up in the most unexpected places. After that, it was only a matter of time before one of the children found that you could shape a rock by banging on it with another rock. After rock carving was discovered, it’s possible that somebody might have happened to shape a rock to form a smoother, rounder surface. Once you have a round surface, it’s harder to hold on to. The smooth rock would have escaped poor Johnny’s (or Suzy’s) grasp, and… rolled! What fun! The children would then have found a new toy to play with. After rubber was discovered, it’s probable that bouncy balls were one of the first things invented. And from that time onward, bouncy balls became one of the prime toys of children everywhere. That was… quite the story. Explanation! Please. Stories are fictional. And you always end your explanations with “the end”? Anyways, thanks for reading, Fluffsters! I hope you have a great week. This entry was posted in real world, Webmaster, writing and tagged real world, webmaster, writing on July 29, 2013 by Webmaster. Hello, Fluffsters! Happy July 27th! New way of starting your greetings? Only when it’s my birthday. That makes sense then, I suppose. Because your birthday has become like a holiday; is that correct? Well, it’s at least a day that I’m excited about. So, just a bit of background. I really like all of these kinds. It’s really hard for me to choose which type is my favorite. So if there’s any difference in the ordering, it’s purely coincidental and only reflects the order in which I thought of and wrote about the different types of cakes. First: flourless chocolate cake. I’ve made this for people more often than I’ve had it for my own birthday cake. But it’s a really good cake. How can you go wrong with something like 8 ounces of dark chocolate per cake? At some point, I’m going to need to upload my favorite ways to make flourless chocolate cakes. But for now, here’s a link to the epicurious cake recipe I use, and the AllRecipes Ganache. If you use the ganache as the frosting, it’s really amazing. The cake itself is already very chocolatey. Add a combination of boiling cream and pure bittersweet/dark chocolate, and it’s one of the most chocolate chocolate experiences you can have. 1) Pineapple Upside Down Cake. I haven’t made one in a while. But it’s really good. Nice and perfect sugary-sticky-sweet-maraschino-cherry-and-canned-pineapple goodness. It can also be a thing of absolute beauty. It doesn’t come with frosting or an icing, which can be a downside. But the crustiness of the cake itself is wonderful, and doesn’t actually need one. Alpha) Carrot Cake with cream-cheese frosting. This is another one of my favorites. If it’s fresh, then recipes with a bit of pineapple in them are really good. Yes, I do like pineapple. How could you tell? Now, a small confession: I really like stale carrot cake. Haha, very funny. I know, it’s a bit odd. But it’s really good! If you wait for a few days, the frosting gets a bit of texture to it. A bit of crunch, that is, which is something I really like with this particular flavor. It’s sort of almost like carrot-cake croutons. Admit it, those sound like they’d be good. Chief) Mud Pie. Not technically a cake, but I don’t know if ice cream cake really counts as a cake either. Mud pie is another one of my more favorite desserts. The coffee ice cream and rich chocolate flavor combine in a perfect flavor harmony. It’s like eating a sugary coffee drink. When done right, it truly is a thing of beauty. S, what about you, Fluffsters? Do you have a favorite birthday cake? I’d love to read about them in the comments below! This entry was posted in cooking, food, list, real world, Webmaster and tagged baking, food, list, real world, webmaster on July 27, 2013 by Webmaster. A list of ways that reading is like an addictive substance. …You actually just wrote that, didn’t you? Uh… I think so. That’s what happens when I press the buttons on my keyboard and they show up in the post area, right? So, yes. I did just write that. And here we go. 3) You need to wait until it runs its course. As in, once you’ve started a book, it’s really hard to stop until the book (or series) is done. 2) When you read, you experience things that aren’t really there. At least, those of us with hyperactive imaginations actually do. You see the princess try to run away from the boring castle to volunteer for a dragon. You hear characters talking with each other. I mean, what sort of thing is this “reading”, anyways? 1) You can never stop. Once you learn how to read, that’s it, you’re done. You will never be unable to read again. Addicting, right? And libraries really don’t help! You can just walk right in, all secretive (well, you’re supposed to keep your voice down anyways) and choose the perfect flavor of book, and then, after a bit of magic with a card happens, you can walk out of there with something new to read. Scary, right? So, Fluffsters, what did I miss? How do you think a book is like some sort of addictive substance? This entry was posted in real world, Webmaster and tagged reading, wha? on July 26, 2013 by Webmaster. OH NO. NOT your crazy conspiracy about how rainbows are creepers again? …I’m going to pretend I didn’t hear that. AS I was saying. In honor of him showing himself to me, I drew a picture of him. That way if he attacks me, I’ll be able to report him to the police, and already have the pictures for the wanted poster available. He’s hiding in a TOTALLY inconspicuous way, so that he can POUNCE! Who makes wanted posters? That’s not true! There are over 22,000 people searching for “wanted poster” templates! 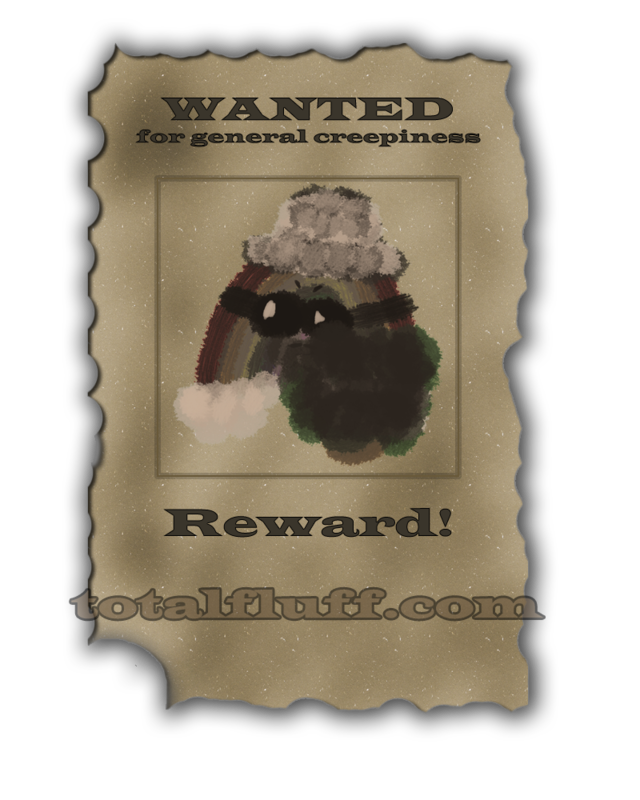 So, my wanted poster can’t be out of the ordinary. Uh… I was referring to your referring to rainbows as “creepy.” And drawing creepy rainbow pictures. Now that is definitely not true. First, that picture isn’t that creepy, except for the rainbow in it. Even so, I couldn’t help but cute-ify him a bit. 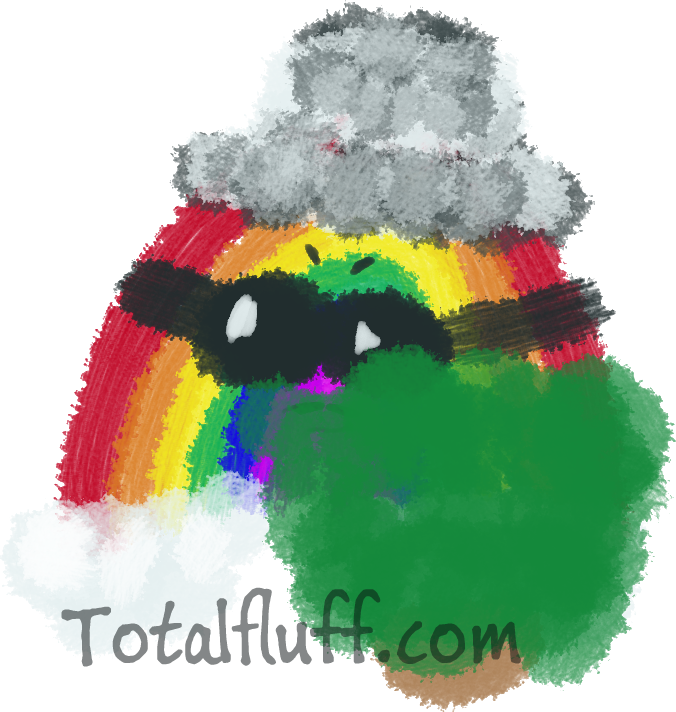 Second, there are search results for creepy rainbow pictures. (A lot of them are a lot creepier than that picture. So I don’t suggest doing it. …So why did you look in the first place? Empirical evidence against your position? …I guess that actually makes sense. Anyways, Fluffsters, happy Thursday! Just think, it’s almost the weekend! This entry was posted in clouds, conspiracy, drawings, real world, Webmaster and tagged conspiracy, drawings, rainbows, real world, webmaster on July 25, 2013 by Webmaster. You’re still so obsessed with other countries’ royalty! I mean, really. How many articles about the new royal baby do you need? First, I think it’s mostly just the British that we obsess about. Second, given that we’re writing one, at least one more article. Third, you do realize that you linked to a British article? They’re probably permitted to be more excited about a new royal baby than we are about new presidents every few years. Ok, fair point. In my defense, though, I did get to that article through an American website. In all honesty, I’m not actually that upset. The Baby will be important. When it comes down to it, he probably already is important. Even if the monarchs of that realm do not have the same power as in my home land. From what I can tell, the United Kingdom’s monarchs are mostly symbols. I don’t think they do that much in making policy decisions. But symbols are power. One article put it as the baby being a symbol of the country continuing for another generation. I could understand being excited about that- if it were my own country. Since you Americans aren’t British, though, I don’t entirely get it. The way I see it, it’s an opportunity for us to make a big fuss and get excited and look at cute baby pictures. The British Royalty are essentially celebrities in America, after all. That doesn’t mean I have to agree, however. Of course not. Now, if you’ll excuse me, I’m going to look for more footage of the new prince! Well, Happy Wednesday, Fluffsters! I hope you have a great week. This entry was posted in fluffy, pointless, real world and tagged Fluffy, pointless, real world, RoyalBaby on July 24, 2013 by Webmaster. Gee, not thinking of any particular ideas for your Fluff Posts, Webmaster? But just tonight’s. Until inspiration hit. (Spoiler alert.) Because, you see, I realized what I could write abou- Oops. more spoilers. Sorry. I should probably just start the post. 1) Look at the clock. Realize that it’s only 9:00pm on the 22nd. (12:00am on the 23rd Fluff Time.) You’ve got plenty of time to start spinning some yarn/thread/stuff before you need to start writing a fluff post! It’s a whole nine hours before it needs to be up and ready! 2) Lose track of time while wasting time. Look up at the clock again at about 11:00pm. Realize you’ve still got a bit of time before you were planning on going to bed. Huh, yeah! I have just achieved a life goal! That’s fun! 3b) “brainstorm”. Otherwise known as look around the internet, wander your current location aimlessly, and maybe read a book. All to get “inspired”, of course. 4) Focus. Fabric. Fabric is a good option- it’s fluffy, right?. Go to fabric.com to drool over all the fabrics available online that you can’t afford yet. Well, that you might be able to afford, but realize that you just bought about 5-10 yards of fabric recently that you haven’t started to use yet, and realize that you really shouldn’t get any more fabric. Even if it’s penguin printed fabric. More to the point, penguin printed fabric that would match your penguin socks perfectly. 4b) Realize you can’t use fabric.com exclusively for your fluff post. Especially if you haven’t actually ordered anything from there (which I personally haven’t.) Besides, there’ve been enough posts on this blog about other websites already. 5) Stare at your messy counters. Realize that you’ve already written a post about how to messify any surface in just a few simple steps… there goes that stroke of inspiration. 9) Get sidetracked by a conversation with Fluffy about what this post is going to be about. And give spoilers. You can’t forget the spoilers. 10) Start writing. Get up to point ten (Hey, look at that!) and wonder whether you should include pictures in your post. 11) Decide yes, and then decide to ignore that decision. And the sudden itch in your fingers to pick up a pen and try to figure out how to illustrate this post. 12) Realize that it’s almost 1:00am, and that you can always update the post later. So there you go, Fluffsters! That’s how to write today’s post in 13 circuitous steps. Happy Tuesday! Wait, what about the final conversation with me? It didn’t happen! You mean the one we’re having now? I think it sort of slipped my mind. Anyways, as I was saying, happy Tuesday! I hope you have a fantastic week! bonus: 14) Waffles) Realize that somewhere in there you took a screencap of how this post is the 1337-est post yet. Insert that picture, and an ambiguous timeframe. Is this supposed to have happened before or after I go to bed? blue) Change what had been 14 above to waffles. Ambiguous times in lists and instructions are even more confusing when you have numbered lists. So ignore the numbers, and change it to something nonsensical. Return to the rest of 14 as usual. So, once again: Happy Tuesday! **update** Disclaimer: Results may vary, based on word choice. Simply following these directions does not guarantee that an identical post might easily be written. This entry was posted in instructions, pointless, Webmaster and tagged instructions, list, pointless, webmaster on July 23, 2013 by Webmaster. Today, I’m going to go a bit more contemplative, and examine one of the big questions in life. Wow! You’re actually going against the grain of no content for TotalFluff? No more so than usual. And significantly less so than many of your posts. Who on Earth even discovered the use of Aloe? According to some websites, some animals do eat aloe. But one bite with the aloe flavor, and any person should have preferred starvation to consuming any of that nastiness. In my opinion. Even if not, that still doesn’t answer the question. Who decided it was a good idea to smear the inside of plant-leaves on our skin? It doesn’t even smell nice! My current hypothesis is that aloes are actually a space-plant, brought over by the aliens currently hiding in Area 51. Clearly they would have told ancient humans how to use the plant properly, and this is just further proof that rainbows are conspiring against us with the governments of the world to take away all the cookies. But what do you think, Fluffsters? How do you think we discovered the proper use of aloe? Just when I think things are getting normal… If you don’t want to answer the Webmaster’s question, here’s a different one to answer: Why do you think the Webmaster always has to create new conspiracy theories? This entry was posted in conspiracy, real world, Webmaster and tagged conspiracy, real world, webmaster on July 22, 2013 by Webmaster.